Contrary to business complaints, the data show investment is healthy. Non-residential investment grew at a 16.3 percent annual rate in the third quarter, accounting for 1.54 percentage points of the 2.5 percent GDP growth in the quarter. Consumption growth was weak at 2.4 percent, but considerably better than the 0.7 percent rate reported for the second quarter. Growth for the quarter was depressed by a sharp decline in inventories. Final demand grew at a somewhat more respectable 3.6 percent rate. The investment performance in the quarter was both a continuation of the healthy growth rate in equipment and software investment, which rose at a 17.4 percent annual rate, and a 13.3 percent growth rate in non-residential structures. The acceleration in the growth rate for equipment and software investment in the quarter puts it somewhat higher than its 10.0 percent rate over the last year. Some of this are likely erratic factors with the timing of investment, but equipment and software investment is likely to remain healthy. At 7.5 percent of GDP, this component is only modestly below its 8.0 percent pre-recession share. The growth in non-residential structure investment is impressive because it followed a 22.6 percent growth rate in the second quarter. While these sorts of growth rates will not be sustained, it is likely that the downturn in this sector is over. In future quarters, non-residential construction will be edging higher. Cars and health care were especially important for consumption growth, adding 0.31 percentage points and 0.61 percentages to growth respectively. The strong car sales were largely a jump back from the second quarter when they subtracted 0.42 percentage points from GDP growth. This was explained in large part by a shortage of car parts resulting from the earthquake and tsunami in Japan. The growth in health care, which accounted for almost 25 percent of the quarter’s growth, indicates the continuing bloat in this sector. It is consistent with the sharp uptick in health care employment reported for last month. Trade was a small positive in the quarter, adding 0.22 percentage points to growth, approximately the same as in the last quarter. Import growth was a relatively weak 1.9 percent. This is directly connected with the running down of inventories. Inventories are likely to stabilize in the next quarter, which will imply more rapid growth in imports. Until the dollar declines further, which will likely happen if and when the euro zone situation stabilizes, trade is likely to be a modest negative in the growth data. The government sector was flat in the quarter after subtracting from growth in the prior three quarters. The biggest factor keeping government out of negative territory was a 4.7 percent rise in defense spending. This will likely be reversed in the fourth quarter. Government has shrunk at a 2.4 percent annual rate over the last year. It is likely to continue to be a drag on growth through the next year -- although, perhaps somewhat less than in the last year. Most of the cutbacks at the state and local level have already taken place. There continues to be no basis for concerns about inflation. 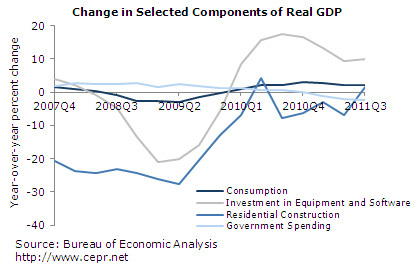 The GDP deflator increased at a 2.5 percent rate, while the core consumer expenditure deflator increased at just a 2.1 percent rate, down from 2.3 percent in the last quarter. The economy is settling into a pattern of sustained weak growth. Investment growth is likely to remain relatively healthy as equipment and software investment stays strong, while structure investment becomes at least a small positive in the growth data. Housing has bottomed and will likely be a small positive going forward. Consumption growth is likely to be in a 2-3 percent range. Consumers still have not fully adjusted to their loss of housing wealth (at 4.1 percent, the saving rate in the quarter was well below the 8 percent pre-bubble average), so consumption is likely to trail income growth. Given the depth of the downturn, this pattern of weak growth is grossly inadequate. At this pace the economy will never return to full employment since it is just keeping pace with the growth of the labor force. However, because many analysts had raised concerns of a double-dip, this growth is likely to be viewed as good.